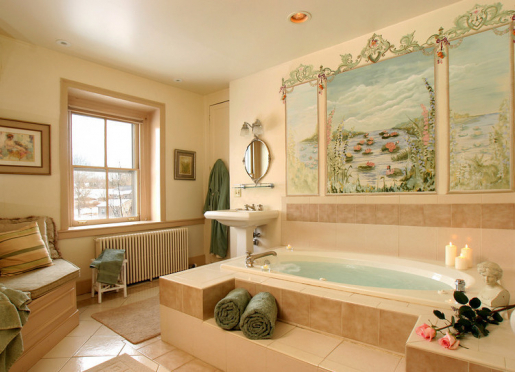 Enter the tranquil world of Woolverton Inn, a Bucks County Bed and Breakfast near the beautiful towns of New Hope, PA and Lambertville, NJ. 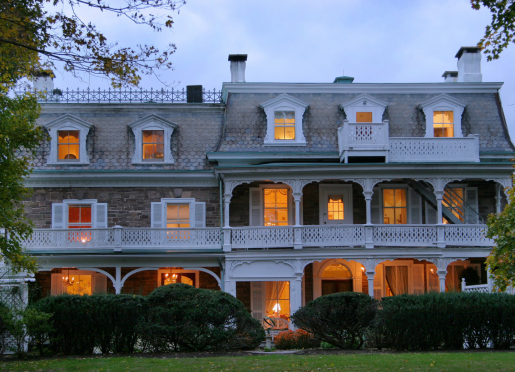 Woolverton Inn is a country estate offering the ultimate in privacy and luxury, nestled on 10 park-like acres and surrounded by 300 acres of preserved farmland and forest. 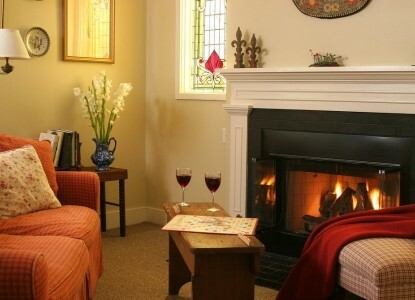 This acclaimed New Hope B&B, perched high above the scenic Delaware River, provides a romantic and comfortable base from which to explore the countless fine restaurants, shops and attractions of New Hope and Lambertville - both towns just 5 minutes away. We invite you to come and experience all that we have to offer at our wonderful New Hope, PA inn! 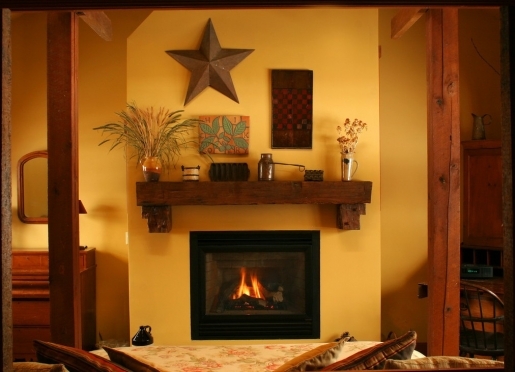 We think you'll agree that our enchanting Lambertville, NJ bed and breakfast is the ideal place to enjoy the perfect romantic New Jersey getaway! So why wait? 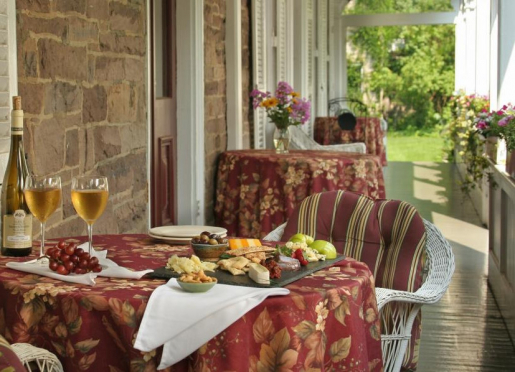 Come visit Scenic Bucks County and see for yourself why the Woolverton Inn is the Stockton, NJ bed and breakfast of choice for visitors to both Lambertville, NJ and New Hope, PA. Make your reservation today for pampered luxury! 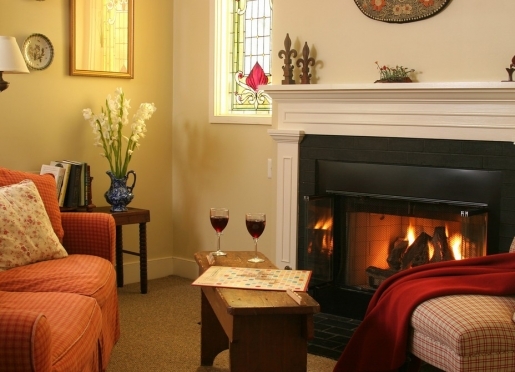 Woolverton Inn is the Perfect Four Season Getaway! Travelers are always looking for memorable and relaxing experiences. Let’s discover more through the words of our innkeepers. Many thanks to Mary for sharing her own secrets with BBOnline.com! Our tagline is “A Faraway Place Close to Home.” Travelers are seeking luxurious relaxation, a romantic getaway or a home base from which to pursue active pursuits or an exploration of the arts. We are located within two miles of the culturally rich area of New Hope and Lambertville which abounds with art galleries, performing arts venues, antique dealers and other merchants. The 35 mile Delaware River Canal recreational area is a 5 minute walk from the Inn and offers some of the best cycling, jogging and walking trails along the Delaware River. 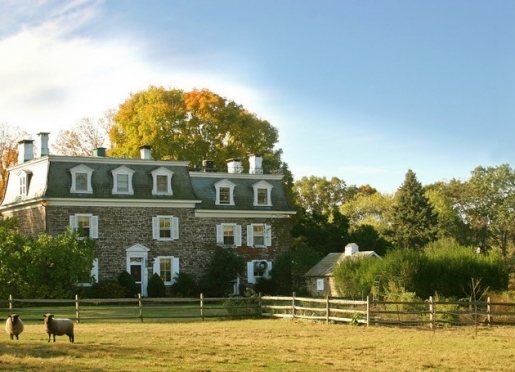 The Inn is best known for its beautiful setting on a grand, historic 10 acre country estate surrounded by 300 acres of protected farmland perched high above the Delaware River. It is within 3 miles of the cultural city hubs of of Lambertville and New Hope yet seemingly far away. The historic stone buildings date back to 1792 yet have been renovated with modern and luxurious features. 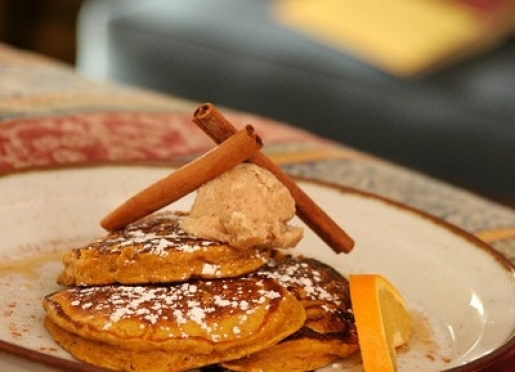 Breakfast at the Inn is consistently regarded as a meal that is never forgotten. And…we have four sheep grazing on our property - guests love to watch then and some even venture to feed them. They are friendly and help create that special relaxed atmosphere. Lambertville and New Hope offer the unique blend of cultural richness, active lifestyles, and the freshest culinary goods thanks to abundant farmland. “It’s just so easy to fall in love with everything about this place"
I think its the fact that there really is so much to see and do - most people think of one thing such as antiquing or tubing down the river, but there are lots of things to do on both sides of the river and in all directions. 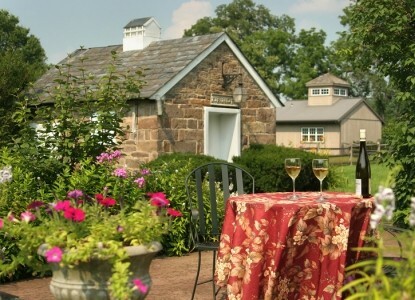 Bike, run or stroll along the Towpath, picnic at Bull’s Island, venture down the river in a kayak, canoe or tube, see a play at the Bucks County playhouse, tour one or more of the many wineries in NJ or PA, shop for antiques, browse local galleries, visit Washington’s crossing, tour Bowman’s Wildflower Preserve, select from a wide range of nice restaurants and experience different fare each day or night, enjoy drinks at the historic Boathouse Tavern in Lambertville, venture to Frenchtown, NJ or take a long drive through Bucks County PA. The recreational jogging/walking/cycling paths along the Delaware River are just a 5 minute walk and downtown Stockton with its fine collection of restaurants, weekend marketplace and fine wine purveyor is only 5 minutes further. Yes, we have one pet friendly cottage where our guests are welcome to bring 1-2 dogs. 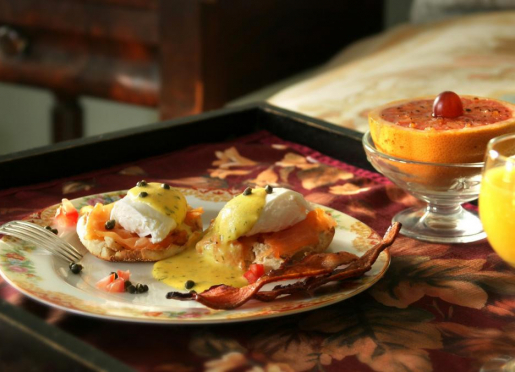 Our extravagant three-course country breakfast can be enjoyed in bed, in our beautiful dining room or out on the garden patio. 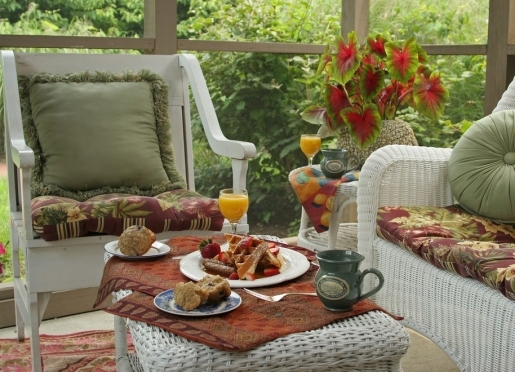 Enjoy your vacation and sleep in, as breakfast is served until 10 am at our New Hope bed and breakfast. Our signature recipes include herbs, greens and berries harvested from our kitchen garden! 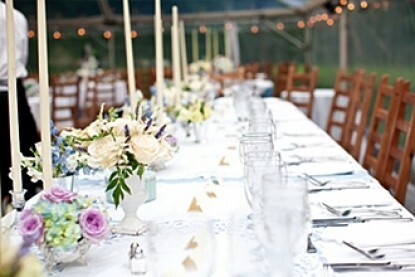 Dreaming of a country wedding? Woolverton Inn offers an exceptional New Jersey wedding venue where you can relax and enjoy your wedding weekend with friends and family. We can accommodate up to 150 guests for your celebration, and together with our chef Michelle Pulaski of DiSh Catering, we will help you plan a fabulous menu and reception. 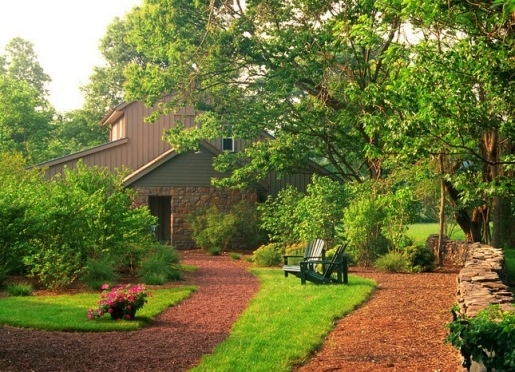 Our property features a beautiful horseshoe shaped garden with an arbor perfect for an outdoor wedding ceremony. To learn more about renting the inn and our wedding packages visit our website! 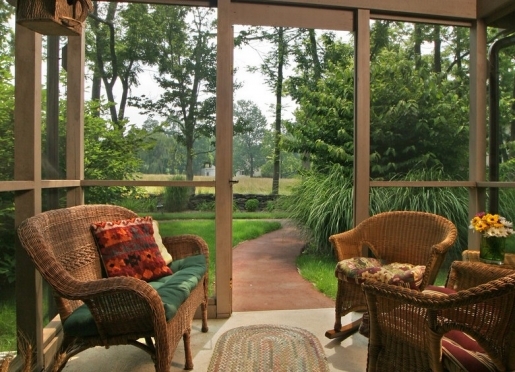 Woolverton Inn offers pet friendly New Jersey lodging in our beautiful Garden Cottage. 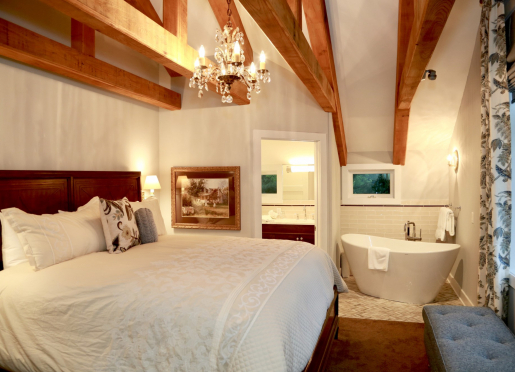 This spacious suite in our renovated carriage house features a private entrance with French doors that lead out to a private garden with sitting area. You and your dog will love it! Learn more about our pet friendly accommodations on our website. 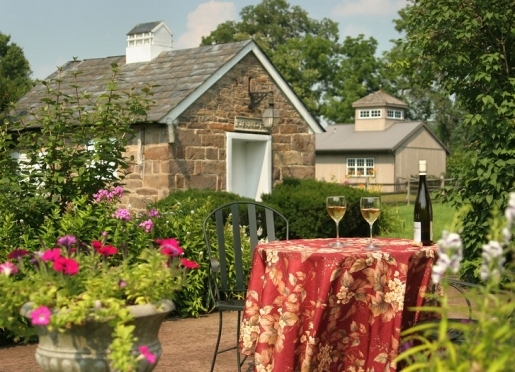 Woolverton Inn is secluded yet very close to the popular destinations of Lambertville and New Hope. You're guaranteed to find something to do, if you can pull yourself away from your luxurious accommodations. Dining by firelight at the historic Sergeantsville Inn - intimate, romantic and just a three mile drive down a country road from the inn. An excursion to The Golden Nugget Antique Flea Market on a crisp Wednesday morning. Visiting the "smiling sheep" under the towering hemlocks along Cuttalossa Road, one of the most picturesque spots in Buck's County. A Buck's County back road drive to Doylestown, concluding with a visit to Henry Mercer's "castle", Fonthill, and neighboring Moravian Pottery and Tile Works. A slow tube ride down the lazy and forested Delaware River. Biking down shady Lower Creek Road behind the Inn through The Green Sergeant Covered Bridge, the last surviving covered bridge in NJ. And then continuing to the village of Rosemont with lunch at the Cafe, formally a country general store. An afternoon of strolling and antiquing in Lambertville, followed by an early evening cocktail at the intimate Boathouse Tavern. A shopping excursion to Frenchtown, NJ, followed by a leisurely drive back to the Woolverton on beautiful River Road in Pennsylvania. A barrel tasting tour at a local winery and then a nap on a featherbed! Selected "one of the most comforting places in Philly. 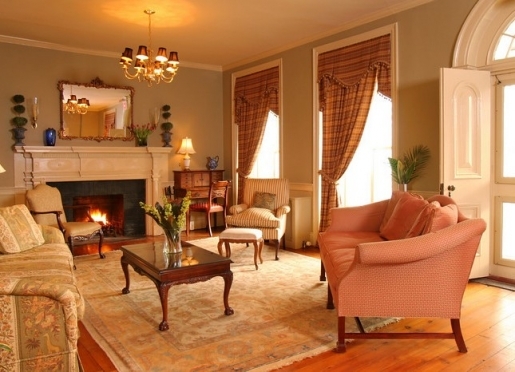 Woolverton Inn: B & B Bliss"
Philadelphia Magazine "The 42 Most Comfortable Places in Town"
"The three energetic ex-Chicagoans have infused the inn with personality and pampering touches." Immediately on your left is Woolverton Road and a sign for the Inn. Take The Pennsylvania Turnpike (Interstate 276) East. Take exit 28, (Route 1 North) 4 miles to Interstate 95 North. Drive along the Delaware River on Route 29 for 8 miles until you reach the antique-rich town of Lambertville. In Lambertville, the road becomes 4 lanes, stay in your left lane. At the light (Bridge Street) make a left, then an immediate right continuing on Route 29 North.